"Come to the Isle of Muck to get away, relax, and enjoy the wonderful wildlife and scenery." 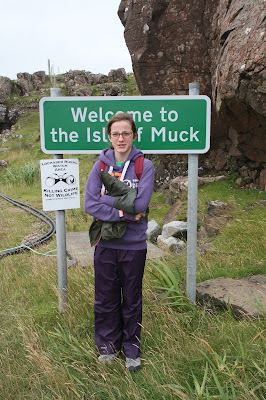 For many years I have wondered about the islands off Britain and so Sonnet puts things in motion: We visit the Isle of Muck in the Inner Hebrides of Scotland (we cross Rum and Eigg on the ferry). Muck measures about 2.5 miles east to west and has a population of around 30, mostly living near the harbour at Port Mor. The other settlement on the island is the farm at Gallanach. There is a small hotel, a tea shop and not much else on the High Street. Tom picks us up at the ferry station in an ancient Land Rover meant not for Chelsea but the unpaved roads of the isle. With us are 12 or so visitors here for a family reunion which means the local accommodations are otherwise sold out (this would qualify as "packed"). Tom and his family live here 365 days a year for the peace and solitude. They own a bunch of sheep, which Rusty chases with joy to Sonnet's horror, on a farm estate that stretches to the water. Amazon delivers the essentials. Of course it is rainy and window but that is the point. I find an unexpected emerald bay to skinny dip.